What does a house concert really need? The performers will need a stage area of some kind – maybe just an area rug, maybe something more elaborate. A space of approximately 4′ by 6′ should do. They’ll need to get to and from the stage easily, and when they’re “on stage”, they’ll need to be seen and heard by the audience. Some performers like to stand and some like to sit and the space needs to be able to accommodate both of those things. 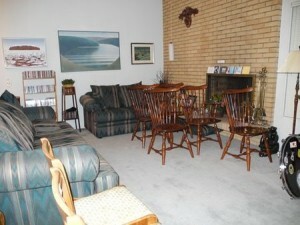 You’ll need adequate space and chairs for an audience of approximately 30 people. They need to be able to get to and from those seats, not just at the beginning and end but (to some extent) during the show. Round up all of your chairs: kitchen, dining room and office chairs are fine, but beware stuffed chairs and sofas by themselves are a very inefficient use of space. If you do use them, try bar stools or taller chairs behind for an extra row. If you don’t have enough chairs at home, you may find that your neighbours won’t mind bringing a few, or that the local hall or church has folding chairs they could lend out. If you’re unsure, do a test with one full row across and one seat for each row deep. This will give you a good idea of the number of people you can fit. Make sure people can reach your room and move around in it. You might have the perfect attic to play in, but you can’t expect people to crawl up a spiral ladder to get to it. You might be able to cram 40 chairs into your den, but without aisles for the performers to get to and from the stage, and for listeners to get to and from their seats, it will be unworkable. The fewer staircases and twisty little hallways people must traverse from the entryway to the performance room, the better. Ideally, you would like the audience to enter towards the back of the room (away from where you put the stage) so guests won’t cross in front of the performance once it’s underway. 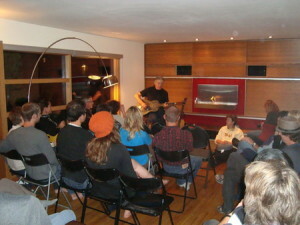 Acoustics are more of an art than a science, but in a house concert it doesn’t have to be complicated. The key is to maximize the amount of sound that goes straight from the performer into the audiences’ ears and to minimise the amount of sound that gets absorbed or bounced around. Performing outside “in the middle of the yard” is practically impossible in a pure acoustic setting. Most of the sound flies away into the blue, and all the surrounding noise pours in to compete. This is why doing a house concert indoors is best. Parking: if parking areas are not obvious, ensure directions to your home include the location(s) people could/should park their vehicles.